Today is the feast of the Ascension on the Orthodox calendar. Of all the Christian holidays, I find the Ascension the most perplexing. What, after all, can it mean? The Incarnation is a mystery, but even it makes more sense to us than the Ascension. How should we think of the creature creator in glory? I think of the Khrushchev’s story that the Soviet Cosmonauts saw no God in the heavens. I wonder if he was serious. Do most atheists think that Christians are no different in their spiritual understanding than animists? Is it all, as they say, superstition in their eyes? Nonetheless, why does the Ascension have the imagery that it has? Is it simply language that is conducive to our terrestrial psychology? I do not know. Come, Lord, and tarry not . . . Yesterday, John Couretas posted a piece of the habitually insightful Orrologion, “Sacrificing All,” on the American Orthodox Institute’s blog. I suppose that I am poorly inclined to appreciate the disgust at “ethnic” parishes. Having lived abroad myself, I know how refreshing it is to hear and to speak English while dwelling in an alien land. I do not begrudge the Greeks their Greek or the Serbs their Serbian. Of course, immigrants to the U.S. should learn English, but let me respond to Orrologion’s point of social etiquette. It is highly artificial to speak another language to a person whose primary language is also your own. Moreover, after spending the rest of the week in a foreign language, perhaps these folks just wish to indulge in some leisure during the post-liturgy meal. I don’t think that such is rude. It’s natural. I am not a multiculturalist, but if visiting Americans are so intolerant of hearing another tongue, then how can we expect them to be open about a new faith? If someone ignorant of Orthodoxy decides to venture into an Orthodox church, such an adventurous person would not be so narrow in his sensitivities. I wonder if folks sometimes conflate their image of “ethnic” parishes with that of exclusive, “in the club” communities. Surely, it is the exclusive, “you’re not welcome here” attitude that people find objectionable. To sound a bit hokey, a smile and friendliness know no linguistic boundaries. Of course, openness to strangers and etiquette in different cultures differ a lot, and these different rules may give the impression of exclusivity. Yet, English speaking, all American communities of converted WASPs can be just as unwelcoming. Thus, we ought to be mindful of ourselves and to try to accommodate others in love. Such, I guess, is Orrologion’s point. Yet, I wonder if something else lurks in the criticism of ethnic parishes (not necessarily by Orrologion, but generally). Something that I find disturbing about Christianity is its morbid insistence on the one thing needful, as if we were simply noetic beings with no other object but the Trinity itself. While I agree that there are priorities and that God should be at the top, and while I acknowledge that God is the highest good and that God is the source of all other goods, I think that there is a thread in our faith that justly merits Nietzsche’s condemnation of Christianity as a form of nihilism . . . a Western Buddhism that denies and hates the world because the world is not perfect—because the world is not God. This tendency existed in the early centuries and it survives, spreading like an infection through all the mutations of Christian history. To me, it is one of the best arguments against the Christian religion. Yet, I don’t think that this attack accurately understands Christianity (and so I remain a Christian—though sometimes I question my choice). For we believe that God creates and sustains the world, that the world mirrors the splendor of God, and that we should strive to see God in and through the world. We are not to see only God purely, without creation, but rather to see and rejoice in creation as an image of God (as the Latins say, as vestigium, imago, and similitudo). We render thanks to God for the world, and thus we rightly esteem and love the world as a beautiful God-given treasure. What does this have to do with Orrologion’s post or with general criticisms of “ethnic” parishes? I fear that this sort of nihilistic fanaticism, though limited and small in dose, might lurk behind the criticisms of the “side benefits” of a Christian community. Obviously, we need to have our priorities clear. If a parish fails to facilitate spiritual growth, then it is not doing its job. Yet, if it preaches the gospel, offers a rich liturgical and sacramental life, and shares its love and blessings with those around it, we should not fret over its being a social setting for its members. As a community, if teenage boys wish to play basketball, if old women wish to knit, and if expatriates wish to reconnect with their blood tribe, then that is fine, too. Man may not live on bread alone, but he still has to eat. Though Orrologion offers some undoubtedly useful advice, his post bothers me . . . in a similar way as most of the ascetics’ wisdom bothers me. Though pastorally and psychologically practical, there is something about the post (and desert wisdom) that strikes me as false. Like the tendency in Christianity that is so intent to avoid pride that it mutates into false modesty and self-hatred, Christianity’s pious exclusive focus on God sometimes turns into a poisonous nihilism. In an attempt to avoid idolatry, this extremeist vein in Christianity thereby commits acts of ingratitude and of blasphemy. It is heartening to see movement to address some problems, though I wonder if the proposed solutions will be worse than the current mess. The practical arguments for an Ecumenical Patriarchate active beyond its own sphere are good ones. They are the same arguments for papal primacy, and it is easy to see how administratively such a system makes sense. Of course, we must ensure that enhanced administrative power does not mutate into the sacrilege in the Vatican. Just as importantly, though, we should recognize that only a healthy, steadfast Church can be trusted with such powers and responsibilities. Indeed, the ancient Roman Church earned that trust. Does Constantinople of today look like it merits the same faith? For me, the elephantine issue is the sorry state of the Ecumenical Patriarchate itself, robbed of its local population and in captivity to secular Turks. On another post, one of you mentioned Patriarch Meletios Metaksakes “of sorrowful memory” (which is, by the way, very funny). From him until today, it seems as though the Ecumenical Patriarchate has been filled by modernists more concerned with secular matters than with safeguarding the Church and proclaiming the faith. For instance, the calendar issue created disorder, schism, and a host of ills in the Churches, thanks to the short-sighted actions of the E.P. It still has not been resolved. I do not wish to argue about the calendar, but it is clear that such a change should have involved the whole Church in consensus. Greek Christian life still has not recovered from it. You might expect the global leader of the Orthodox to handle this particular anomaly in our liturgical and communal life, especially since said leader caused it. But no . . . Global warming, prying open a back door to Italy for the Turks, and sending warm fuzzies to the W.C.C. are the Ecumenical Patriarch’s priorities. These are not fitting for a successor to John Chrysostom. Furthermore, with the political situation and the circumstances of the Christian flock in Turkey as they are now, what hope can we have in the future for sober leadership in the exercise of the “distinctive ministry of the Ecumenical Patriarchate”? I am rather ignorant about all the political obstacles, but it would be great to see the Athonites elect the patriarch’s successor in addition to the synod. They should just ignore Turkey’s desires. If the Kemalist state refuses to allow the new patriarch to enter Turkey to ascend the throne in the Phanar, then Turkey will have quite a P.R. nightmare on its hands. I am not one that says that the Ecumenical Patriarchate should be moved. Yet, we should be willing to play diplomatic hardball with the secularists and infidels . . . they should elect a successor who may have to govern from the Turkish border. How long would any government be able to tolerate such an embarrassment? I say that we stop whining about Halki and force the Turks to make the uncomfortable decisions. Until then—until Constantinople is a functioning Church again instead of a bureaucracy in a military compound—then it cannot be trusted to wield the sort of administrative authority that it may have had in the days of the empire. Whether this occurs because we drive the Mohammedans back across Anatolia (personal fantasy), the E.P. reabsorbs the Church of Greece (much easier to do), or the monks of Athos provide the candidates and the electors for the patriarchal throne (easiest solution) doesn’t matter for the topic under consideration. Several Orthodox Americans on the site and elsewhere resent “foreign leadership” in the Church. I, myself, could care less if the primatial bishop of my Church is Greek, Russian, Australian, American, or Japanese. I just want episcopal leadership to be faithful and competent. Therefore, my objections to the Ecumenical Patriarchate have nothing to do with its overseas status but with its unseemly contemporary track record. For those of you unfamiliar with the Church in Constantinople, the last century was not a good time for it or for any Orthodox Church. The Ottomans were oppressive, but they generally tolerated Greeks, Armenians, and other Christians. Persecution, genocide, and the like only rarely occurred, which makes the Ottomans beacons of benevolence and of tolerance in the annals of Mohammedan history. When the secularists took over the country after the fall of the Ottoman empire, nationalist and religious tensions rose, in part due to Turkish racism and in part due to political realities. It is difficult (and, I would add, eventually impossible) to maintain a multiethnic state without a ruling royal family or aristocracy to unite the disparate tribes. During the Ottoman period, Anatolia was full of Greek Christians, whose Greek speaking ancestors had populated Asia Minor for thousands of years. During the twentieth century, however, the Turks claimed their “Turkey” for themselves, ethnically cleansing the country to the extent that they were (and still are) able to do so. Now, the Ecumenical Patriarchate consists of only a few thousand Christians in Constantinople itself. This bitter reality has tempted the Ecumenical Patriarchs to rethink their episcopacy in terms of an Eastern papacy as consolation for their lost flock. The Western powers should have allowed Russia to push the Ottomans into the sea in the nineteenth century. The descendants of the peoples who won at Poitiers, Lepanto, and Vienna now face their own crescent menace—but this time, it is one of their own choosing. May they awake from their slumber! Regardless, the Church will survive. Yet, I prefer Christendom to dhimmitude. 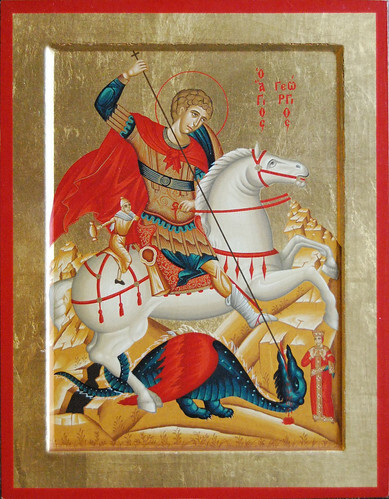 Today is the feast of Saint George on the old calendar (April 23). 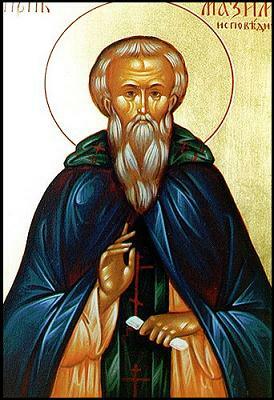 George is one of the most beloved saints. Indeed, he is probably the patron of more nations than any other saint. This is understandable, as he is a role model for principled perseverance, faith, and courage. Plus, he looks really cool on the horse, and military fellows always earn a sane society’s respect. You can read a short summary of Saint George on Orthodox England. George is a patron saint for soldiers, and on this day let us remember the men who risk their lives—and often offer them up—to protect their homeland. In the United States, we easily forget that American soldiers are still fighting and dying on foreign soil. We have become so self-absorbed in our culture that we cannot be bothered any more with our troops overseas. We owe them our thanks. For a small but very accessible way to show your appreciation, consider this idea. Any Soldier and Operation Gratitude coordinate care packages. At the very least, a verbal show of support to the military folks whom you meet in public helps to foster a culture of appreciation in our society. By faith, you conquered the torturer’s godlessness. Thus you received the crown of victory. Alice Linsley manages a blog dedicated to the book of Genesis—Just Genesis. It is “just Genesis” in the sense that most of the posts concern passages, people, or places in Genesis. However, she does comment on other matters that have a tangential relationship to the first book in the book of books. Linsley is a convert to the Orthodox Church from the Episcopal Church, where she was a priestess. I am not aware of any other case in which a woman in the Protestant clergy converted to Orthodoxy, though they might be out there. You can read her story in an interview, “From Canterbury to Constantinople,” posted on Orthodoxy Today. Unfortunately, the original interview on Bible Belt Blogger no longer exists. Orthodoxy Today only contains the first part. You can read more of it in a commentary post by another convert from Canterbury to Constantinople, Clifton Healy—“From Canterbury to Constantinople: Interview with Former Episcopal Priest Alice Linsley on Her Departure from ECUSA to Orthodoxy.” Like Linsley, Healy’s conversion is an interesting story. He was being trained to be an Episcopal priest when he realized that Anglicanism was not the Church that he sought. We all seek God; some of us just happen to hit dead ends sooner than others, it seems. It is probably important to say something about being a Protestant convert to Orthodoxy. It is sometimes alleged, not infrequently by Protestant converts to Roman Catholicism, that we former Protestants who’ve converted to Orthodoxy would otherwise have converted to Rome were it not for our ingrained anti-pope, anti-Roman Catholic views. That is to say, it is often asserted that we converted to Orthodoxy because it was not Rome. I think my account shows something of how that view is inaccurate. For while I freely admit that I retained enough of my Protestant views to find Roman claims about the pope to be non-persuasive, it is not the case that I converted to Orthodoxy because it wasn’t Rome. After all, my first stop after considering Rome was Anglicanism, not Orthodoxy. It also assumes that Rome’s claims are self-evident if only one loses the Protestant polemic. I do not think that is true. It is certainly not true for me. I never much had an anti-Catholic polemic. If there was any sort of “failure” in my not becoming Roman Catholic it may well be a failure of the arguments to persuade rather than that I was not persuadable. But more importantly, in converting to Orthodoxy I was not running from anything–whether my former Protestantism or Roman Catholicism (whether real or caricatured)–rather I was running to something: what I believed, and still believe, to be the New Testament Church in all its fullness. I was given a paradigm in my youth which I have followed out of the Restoration Movement churches, into and back out of Anglicanism, to at last find myself within the New Testament Church which Orthodoxy is. All that said, then, I believe that for the thoughtful and reflective Protestant who senses the substantive lack his own churches leave him when it comes to the life of Christ in his Body, the Church, there are only two possible choices: Rome or Orthodoxy. While it is important to have solid rational reflection for one’s choice of one or the other, ultimately it is not reason that will–or even should–win the day. Such a choice is a choice of faith, from the heart. One must be drawn to one’s choice, with all the best historical, rational evidence and reflection one can muster, to be sure, but ultimately one must be drawn in by the life and worship of that church one is choosing. It will do no good, when reason fails, to fall back on reason. One will only have left one’s heart, and if there is nothing there, what is one to do? For me, there was only one possible choice. In the midst of all my rational, historical, and evidenciary seeking, I worshiped regularly in an Orthodox parish, and prayed, in my own personal prayers, the prayers of the Orthodox Church. The reasons for becoming Orthodox were rational, coherent, and justified. But the motivation was the draw of the worship and the life I could see lived before me. I prayed my way into Orthodoxy. My becoming Orthodox has, since my chrismation, been further experiential testimony upholding and further justifying my choice. But my choice was ultimately made from the heart, not the mind. For God lives in and works from the heart, first and foremost. Our minds must descend to the heart and there partake of the truth. For the God who is truth dwells there first. It was Orthodoxy that so led me first from the mind, but ultimately from the heart. And it is from the heart that I know my decision was right and true. Concerning the bit about Protestants who convert to Orthodoxy, I have also heard such criticism. The obnoxious Orthodox equivalent might be that Protestants who swim the Tiber only do so because Rome makes the journey so accessible due to its presence in the West and because the cultural affinities that Protestants have for their ancestral religion make the transition easier. Why go the whole road to ancient Christianity when you can latch on to an intellectually defensible ship that is not entirely foreign, that is all around you, and that does not require much of you anymore, anyway? Of course, this would be unfair—though undoubtedly true for some converts. Likewise, the papist claim about Protestant converts to Orthodoxy probably has some truth to it, as well. I wonder, though, if some of those anti-Roman prejudicial tendencies are justified . . . Nevertheless, my own experience, like Mr. Healy’s, does not fit such an accusation. Having a Protestant mother and a Roman father, I was exposed early on to both sides of the Reformation divorce. I developed a list of things that I liked and disliked about both camps. However, when I encountered Orthodoxy as a teenager, my way of assessing the Protestant-Latin dispute radically changed. Orthodoxy did not solidify my anti-Roman tendencies but melted them. My hostility to Roman Catholicism abated as I immersed myself more in the Orthodox Church—figuratively and literally. I still have significant criticisms of Rome, but the ingrained Protestant hatred of that old whore on the seven hills has worn off. As a half-breed, such animosity was never that deep, anyway. I agree with Mr. Healy that the serious, intellectually honest Protestant only has two choices: East or West. As Cardinal Newman stated, “To be deep in history is to cease to be Protestant.” My intelligent and pious Reformed friends scoff at this, but I think that such a person can remain a Protestant only to the extent that he refuses truly to consider ecclesiology. I have heard so many folks tell me that they have abandoned the poisonous framework of the Reformation, that they have embraced the apostolic and patristic heritage of the Church, and that they can keep what is good about Protestantism without accepting its deficiencies. Why abandon the religion of one’s birth, culture, and social milieu . . . why give up Protestant congregational and charitable vitality, the Reformation’s proud tradition of homiletics, and practical relevancy in today’s world, when one can be “catholic” and “orthodox” while simultaneously being a member of the local thriving megachurch or of the healthy community mainliner? They justify their decision with appeals to the indivisible Church. Such a defense reminds me of the Cathars’ belief in their “real selves” as spirits, which allowed them to justify doing what they wished with their unimportant bodies. Indeed, the dualism of the old heresies always resurfaces in ever new and interesting ways. A lone blue automobile drives down a deserted road. When it reaches a tiny two-pump gas station, a man steps out. Seeing no one else around, he beeps his horn. The door to the station pops open; three minimally-clothed young women step out as ZZ Top’s “Legs” plays, sans vocals. After a bit of posing and wiggling, they go to work cleaning and gassing up his car, until the man notices a cross hanging around the neck of the blonde. Marge, Lisa, and Maggie sit on the couch, watching all of this on TV. “These Super Bowl commercials are weird,” Lisa concludes. I could not find the clip anywhere, but you can watch it by fastforwarding through the full (rather disappointing) episode here (at minute 15:08). It’s riotously funny! Sadly, Bill Donohue of the Catholic League did not appreciate the point and attacked the show for anti-Roman bigotry. Yet, only the “Buddy Christ” and the “Catholicism Wow!” campaign from Dogma come close in paroding the embarrassing ridiculousness of “progressive Catholicism” in popular culture. Unfortunately, these Age of Aquarius Latins will not allow art to trump nature; their own actions top any imagined fictional exaggeration. On WDTPRS, Fr. John Zuhlsdorf comments upon the rampant liturgical and theological chaos in the Roman communion. I am no stranger to such aberrations. I grew up hearing painfully horrid music at mass, from bastardized Simon & Garfunkel tunes worded with religious text to taped singing stopped mid note on an old cassette player. I have witnessed numerous abuses that bordered on blasphemy and heresy (even from Rome’s perspective). Just last year, my father told me that his parish sang “Hosanna” from Jesus Christ Superstar as the entrance hymn at mass on Palm Sunday. Hey, J.C., J.C., you’re alright by me, but some songs don’t belong in the liturgy. Nonetheless, even I, jaded as I am by the postconciliar asylum, found the following clip on WDTPRS horrifying—yet hilarious. Not even Kevin Smith could make that up! It is as if the video were an explantory exposition to The Simpsons’ provided abstract . . . The Catholic Church—we’ve made a few changes. On this third Sunday of Pascha, we commemorate saints Joseph of Arimathea, Nicodemus, and the myrrhbearing women who went to pour spices on the body of Christ in Joseph’s donated new tomb—the Theotokos, Mary Magdalene, Mary and Martha of Bethany, Mary the wife of Cleophas, Salome, Susanna, and Joanna. As my patron is Joseph of Arimathea, today is one of my patronal feast days. Saint Joseph’s main feast day is July 31 (currently August 13 on the old calendar as reckoned on the new calendar). The women steal the show, however. In many parishes, only women sing in the choir on this day, but perhaps this is a Russian custom. My friend Andrew suspects that it is an unusual practice. It is difficult to sort out the myrrhbearing women. There are so many Mary’s in the bible just as there are so many James, and Eastern and Western traditions maintain different identification schemes. Here is what I believe to be the common Orthodox schema. +++ The Theotokos—there is no confusion about this lady. She is the only one listed here who is not represented in the icon above. She is portrayed below (left), along with Mary the wife of Cleophas (center) and Joanna (right). +++ Mary from Magdala—the apostle to the apostles. Western traditions tend to identify her with other Mary’s while the Orthodox do not. She is the woman from whom Christ cast seven demons. In Luke’s gospel, we read about the sinful woman’s anointing Christ’s feet in Simon the Pharisee’s house (chapter 7), and then right after we read about the people who accompanied Jesus during his travels, with Mary Magdalene listed among them (chapter 8). Her description is “out of whom went seven devils,” not the sinful woman who went in peace from Simon’s house. +++ Mary of Bethany—the sister of Lazarus and of Martha. She is the contemplative friend of Jesus who chooses the better part. She also anoints Christ’s feet in the house of Simon the Leper. As there are two accounts of women who anoint Jesus’ feet in a house that belongs to a Simon, some in the West identify Mary of Bethany as the sinful woman and thus also as Mary Magdalene. However, the two events have nothing else in common save the name Simon and the anointing. In one story, we have a typical Pharisee (Simon) who is hesitant about Jesus’ claims, while in the other story, we have Judas Iscariot’s greed as the moral backdrop in the leper’s (Simon’s) house. 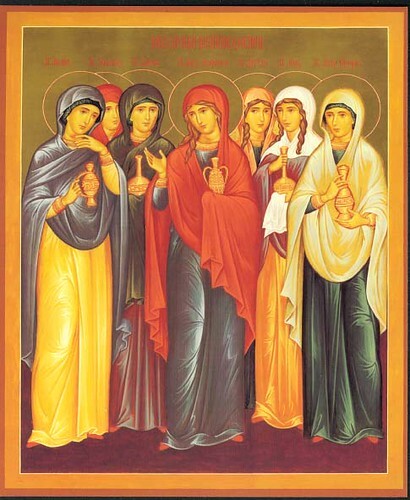 The Orthodox maintain that Mary of Bethany, Mary Magdalene, and the unnamed sinful woman are all different women. Of course, the Western obsession with answers could not easily allow the poor sinful woman to go in peace unnamed. She just has to be one of the listed cast among the New Testament followers. +++ Martha of Bethany—the sister of Lazarus and of Mary. She busies herself with practical matters while her philosophical sister gets away with no cooking or cleaning. Those of us who would like to choose the better part but recognize that meals just do not pop out of baskets miraculously (well, you know, there are exceptions to everything) love and sympathize with Martha. Somebody has to do the busy work for those lazy ingrates (not meaning, of course, Jesus, Lazarus, and Mary—but most folks in the same situation). As such, Martha typifies for me what is especially admirable about women. Furthermore, it would be strange if, in his crucifixion account, Mark did not specify Jesus’ mother as one of the women. Nonetheless, though I am not a biblical scholar, I find it odd that Mark would refer to Jesus’ mother as the mother of James rather than simply Jesus’ mother, as John’s gospel states. Assuming that the mother of James and Joses is the Theotokos, Mark’s account, then, specifies the Theotokos, Mary Magdalene, and Salome, while John’s account specifies the Theotokos, Mary Magdalene, Mary the wife of Cleophas, and the sister of the Theotokos. And many women were there beholding afar off, which followed Jesus from Galilee, ministering unto him: Among which was Mary Magdalene, and Mary the mother of James and Joses, and the mother of Zebedees children. Some traditions hold that Salome is the sister of the Theotokos, and the previous parallel between the gospel accounts in Mark and John appears to agree with this position. Other traditions hold that she is the daughter of Joseph the carpenter, but that does not seem consonant with the gospel accounts unless we assume that Mary the wife of Cleophas is the sister of the Theotokos. To make matters even less clear, there is a tradition that holds that Cleophas is the brother of Joseph the carpenter, which would make Mary the wife of Cleophas the sister-in-law of the Theotokos. We can see how the gospel accounts agree with this tradition, too. Regardless, Salome is held by all to be a close relative to Jesus—an aunt or a stepsister—which would make the beloved disciple John Jesus’ cousin or nephew. +++ Susanna—one of Jesus’ many followers during his ministry. I cannot find out anything else about her. There have been several later saints named Susanna, but I do not know what became of the New Testament woman. +++ Joanna—the wife of Chuza, the steward for Herod Antipas. One account of Joanna that I found speculates that she is the same person as Junia, mentioned in Paul’s epistle to the Romans. However, that seems like an incredible stretch if there is no tradition in support of it. Moreover, one may assume that the Andronicus mentioned with Junia is her husband or brother. If so, and if Joanna is Junia, then what happened to poor Chuza? I have no idea, but the suggestion seems fantastic without other evidence. It is a shame that the various traditional accounts have so many discrepancies. Such inconsistency naturally casts doubt on anything conclusive, especially for us moderns who normally operate with a hermeneutic of suspicion.